Located on a quiet street in historic Racquet Club Estates with stunning views of Mt. San Jacinto, this 1959 Alexander Butterfly House has been lovingly restored and upgraded by two international hoteliers. Having the best of both worlds, this authentic mid-century home maintains all its original charm with the luxuries of modern and environmentally conscious living. Designed and furnished with only the highest grade materials and furnishings, LeMode PS features Bosch appliances in the kitchen, HansGrohe & Kohler rainshowers in the bathrooms, and furniture by Design within Reach™ & BoConcept™. Our favorite part about the 3 bedroom home is the open-concept living space with the living and kitchen space extending onto the outdoor dining area and lounge, creating the ultimate indoor-outdoor area perfect for enjoying the desert life. Watch the sun light up Mt San Jacinto with your morning coffee, then cool off in the new salt-water pool before cooking dinner on the built-in grill, and finishing the perfect day relaxing by the firepit in the jet spa. 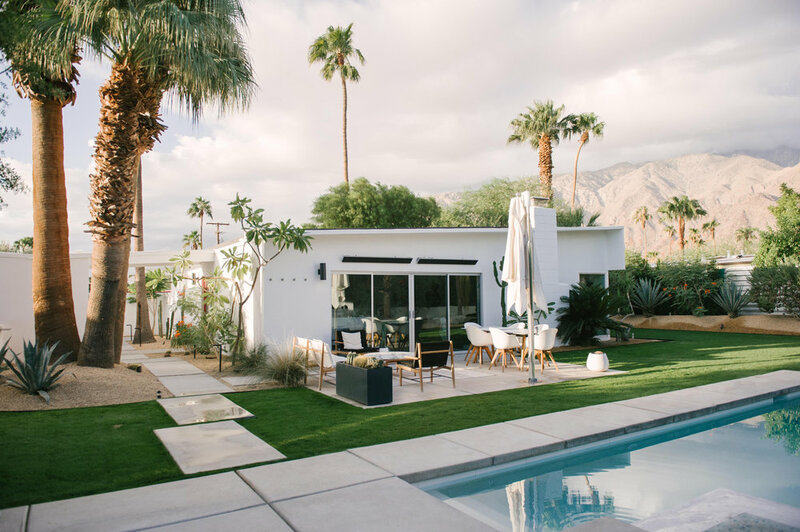 This design gem has everything, and more, you need for your perfect desert vacation. There are 3 bright bedrooms, furnished with Leesa Mattresses and Percale linens, ensuring a comfortable sleep. The Master Bedroom with King bed and ensuite has direct access to a private patio and outdoor shower. The remaining 2 bedrooms have Queen beds. 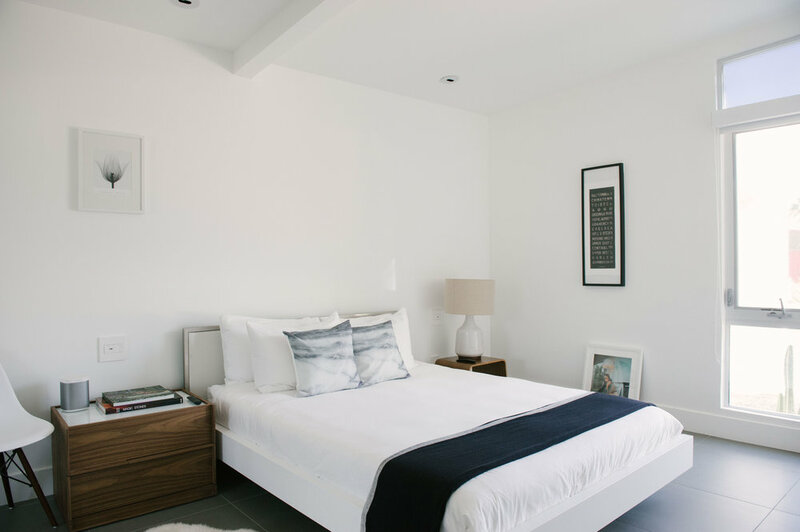 All bedrooms are simple yet refined, featuring built-in closets, Samsung 4K TVs, Sonos speakers, and have bright white interiors featuring framed art and mid-century accents. No detail has been forgotten, creating the ultimate outdoor space to enjoy with family and friends. The gated and secured yard is beautifully landscaped with with 4000sf of grass, a brand new saltwater pool and jetted spa, loungers, umbrellas, outdoor showers, fire-pit, dining and lounge area, outdoor patio heaters and built-in outdoor grill. Wherever possible, the owners have opted for “green” options, creating an energy efficient home. Self-powered with solar & heat pump technology, rock-wool insulation, and all electric appliances. For ease and efficiency, the owners incorporated modern technology such as individual AC control for every room, hepa whole-house air filtration, Samsung TVs and Sonos in every room, backyard surround sound, recessed and dimmed light controls, built-in bedside USB ports, and remote-controlled pool and spa. Nightly rate starts at $595. The single level layout makes it an accessible home. There is no pool fence, so guests cannot leave children unattended outside. Pets are considered on a case by case basis and require an additional fee of $75 per stay. Check out one of our favorite shops, Soukie Modern @soukiemodern for everything Moroccan! You can book this special retreat here and visit their instagram here.